Seniors Shadya Jarecke and Marcell Bruski are ambitious business students at Rocky Mountain College. The two made great strides on campus when they created the club Young Women in Business about a year-and-a-half ago. The club is open to all Rocky students and typically meets once a month. The club’s activities have included presentations from businesswomen in the Billings community. The women share the experience they have acquired in their profession. However, they altered the first meeting of the new semester by bringing in businesswoman and GREAT Self Defense instructor, Carla Verbsky. Verbsky gave a strong presentation on what true self defense is, shared what steps she has taken to become the person that she is today, and taught real self defense moves to over 100 attendees. What made Verbsky’s presentation so outstanding was the fact that she talked about real issues that can happen or have happened to women already, such as being attacked physically, verbally, and emotionally. Verbsky also brought the issue of pettiness to light and stated that women need to stop tearing each other down and should start building one another up. “Women are the ones who have to endure all this pain, we have to be perfect. Everyone tears up because they know what they are going through and I know what they are going through. I can relate. That is why my message was so powerful,” shared Verbsky. 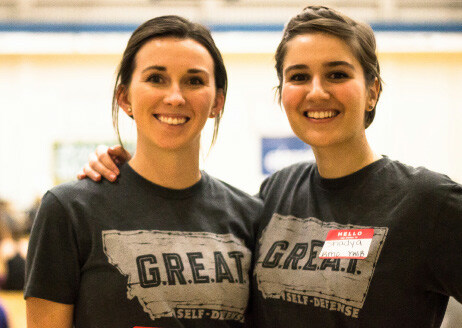 GREAT is a nonprofit organization that launched in April of 2016. GREAT stands for Girls, Ready, Empowered, and Trained. The nonprofit wants to give students the tools to become confident individuals who have the knowledge to defend themselves in any situation. So far, the GREAT team has visited over 17 schools in Billings, three schools in the surrounding area, and have influenced countless people for the better. Jarecke, president of Young Women in Business, met Verbsky through a professor and learned about Verbsky’s story and work. Jarecke shared that the purpose of the event was to empower women and to bring the women from Rocky and the community together. “Through this event we hope that we can create a supportive and strong family of women,” said Jarecke. The club hosted an event similar to this one last spring. One component that made this event different from last year’s is the amount of support and help the club received from Rocky and the community. Stand Up RMC, RMC campus safety, and Ramsey Keller Memorial teamed up with the club to make it a success. Another component that made this event different is the fact that Verbsky brought her co-worker, Dennis Forleo, to help her lead the class. Forleo and Verbsky met through mutual friends and have been building their work relationship since meeting.